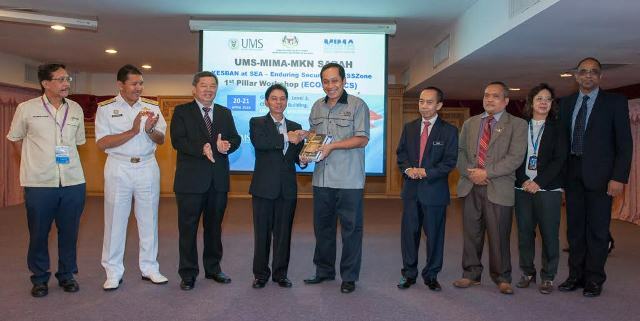 THURSDAY, 29 APRIL – Universiti Malaysia Sabah (UMS) through its Faculty of Business, Economics and Accounting (FPEP) recently organised a workshop focusing on the economy and business activities in the Eastern Sabah Security Zone (ESSZONE). The two-day workshop also involved the Maritime Institute of Malaysia (MIMA) and the National Security Council (MKN). At the opening of the workshop, Minister of Tourism, Culture and Environment Sabah, Datuk Seri Panglima Masidi Manjun said the Economic Development and Investment Authority (SEDIA) would continue to attract investment to the Sabah Development Corridor (SDC) despite the challenging economic situation. “More efforts will be done with emphasis on improving the efficiency of the logistics sector by enhancing infrastructure related to land integration including water and air services,” he said. His speech was read by the Permanent Secretary of the Ministry of Tourism, Culture and Environment Minister, Datuk Ginun Yangus. He also added that the discussion and research on the economic sector in the ESSZONE area should continue so that development of the area could be improved.